So, I’ve realised that I can’t really chronicle my journey from non-Paleo to Paleo on this blog anymore because in my mind, I’m there. I am Paleo and I have no plans to go back. That said – I still have loads to learn and the biggest thing is still new foods. The biggest threat to my new, healthier diet is the foods I used to eat. Like bread and pasta and cereal. Those foods that made eating easy. That said, there are soooo many Paleo alternatives out there for me to try. So, I figure I can try foods and keep blogging AND help out others all in one go! I am NOT a gourmet cook. I am not even a very good cook. I’m an average cook. I know more than boiling water but I don’t have any more than a totally average skill level. So I figure, I’ll find recipes on the net, cook them and then review the experience on here for y’all! Obviously, full credit to the recipe creator (I’ll ensure I post links, I won’t be posting the actual recipes on here), but also not going to pull my punches. If I think its good I’ll say. If I think its something only Matt Moran could successfully produce I’ll definitely say. This way I can start to build up a store of reliable recipes. And maybe you guys can benefit from my experiences! 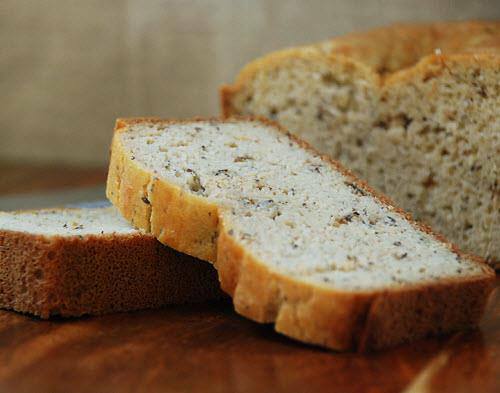 So – my first recipe: Paleo Herb Bread by multiply delicious. Ok so I wanted a savoury bread that I could use to go with meals, or make a sandwich with, just like in the non-paleo days. I’ve tried many, many recipes and they have come out waaaay too sweet, waaay too flat or rock hard and dry. I got a positive feeling from this recipe because it was herb bread – rosemary – one of my favourite herbs! So I thought I’d give it a go today. On the negative side – the amount of mixture that the recipe makes resulted in a ‘loaf’ that is about 25cm long, 10cm wide and 6-7cm high. So I’d want to double the mixture to get a real “loaf size” loaf. Unfortunately that would equate to 10 eggs. Yowsers. Taste is good! The herbs are nice and light (I used a little less than recommended) but still have a positive impact. Taste is neutral enough that it can be eaten just with (grassfed) butter, or with honey, or with more ingredients (eg: a salad sandwich). Texture is solid enough. Its still more crumbly than gluten laden bread but it is definitely solid enough that it holds together. Time – only took me one dish (food processor) and about 10 mins to get the batter together. Perfect! Then straight into the loaf tin and into the oven, so less than 20 mins from go > woah. With practice I could knock that down to 10-15 minutes. I really like that in a recipe. Like, REALLY, really like it. Simple – the recipe had more than 5 ingredients BUT there were literally 2 steps. Dry ingredients in, wet ingredients in. That’s it. I love it. All in all I’m a big fan of this recipe. Its still Paleo bread but its the best savoury version I’ve found so far. And you can leave the herbs out, or use different herbs to change it up. Next I’ll try garlic bread I think. Yum! Overall – I think 8/10 (and that’s a good score, from me). This entry was posted in Recipes and tagged bread, food, garlic, gluten, good, herb, non-paleo, paleo, recipe, review, rosemary, thyme. Bookmark the permalink. It looks really good. I’d like to try it.